Rapture here bringing you my FIRST EVER guide here on SmiteFire :-) As this is my first guide, any and all (constructive) criticism is welcome! I've been playing Smite since the beginning of Season 3, and I've found the Solo Lane is my most comfortable role, and Ravana is one of my most comfortable warriors. Ravana's getting a buff to Mystic Rush! Increased Damage from 150/225/300/375/450 → 200/275/350/425/500. Now provides a 50% Damage Reductions buff to Ravana upon landing. Enemy gods hit by Mystic Rush take 10% increased Damage from all sources. Mystic Rush can now hit Minions. Chain of Blows Successful Basic Attacks and abilities add to Ravana's Combo Chain. Each time his Chain reaches 8 he receives a Shield equal to 5% of his Maximum Health. This may stack up to 3 times. Prana Onslaught hits all enemies in a cone in front of you and deals 80/135/190/245/300 damage (+80% of your physical power) plus slows 25% for 2.5s. Use Prana Onslaught in conjunction with 10-Hand Shadow Fist, and enemies will have a hard time running from you or your team. Overhead Kick deals straight line damage equal to 70/105/140/175/210 (+70% of your physical power). The true beauty of this ability is it's secondary effect. You become CC and damage immune during the animation. Keep Overhead Kick ready just in case you need to dodge I'm a Monster from Scylla or Release The Kraken! from Poseidon, or any other big damage. Also keep in mind you move a bit fast during your immunity frames. ANOTHER big benefit of this is it dodges tower/phoenix damage too... keep this in mind when diving. 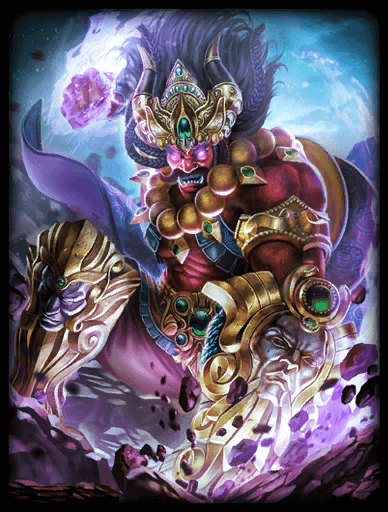 Mystic Rush - Ravana leaps to a target location, damaging all enemies in the area and applying a debuff to enemy gods that increases the damage they take from all sources. After landing, Ravana receives a buff that reduces the damage he takes from all sources. This makes Ravana a pain in the *** to deal with, especailly during the laning phase. Decent damage to confirm kills, and you can take a punishment like none other. The damage reduction work on gods and towers/phoenixes. Don't forget! 95% of the time, go Warrior Tabi on Ravana. The early game power is nice and obvious movement speed is obvious. The other 5%, I go Reinforced Greaves. You won't deal as much damage, but the extra tankiness can help if you're getting ganked alot. Your second full item should always be defense. Are you against a hunter like Neith or Izanami? Build Hide of the Nemean Lion. Ymir or Sobek your dance partner? Build Bulwark of Hope. Going against a healer like Chang'e or Hel? Pestilence will be your best friend. The key here (and overall for solo laners) is counter building. Don't settle for the same build every game. Watch your opponent and build items that willl be most effective against them. Shogun's Kusari recently got a nice change. a little less magical defense, but they chaged the aura to give a 25% attack speed buff, something both Ravana and your ADC will enjoy. Difficulty=Medium Early game, Amaterasu's wave clear isn't fantastic, so at lever 3 when you have 2 points in Prana Onslaught and 1 point into 10-Hand Shadow Fist, you should be able to bully her around a bit. Landing your abilities on Amaterasu will make your life easier. Her Divine Presence does give her a bit of sustain, but you easily match it. You do need to watch out for her Glorious Charge. It can silence you if she hits, making a getaway pretty rough. Dazzling Offensive isn't a big deal. Alright damage and it stuns if all 3 hit. Thankfully you have Overhead Kick to dodge the damage/stun from the 3rd strike. Difficulty=Medium Bellona can be kind of a slight pain to deal with. Once she gets a couple points into Bludgeon, her wave clear is good (Especially with Bluestone Pendant). She can disarm you with Scourge and immune damage with Shield Bash. Thankfully her Eagle's Rally is easy to dodge with Overhead Kick. Play smart and Bellona won't be a huge problem in lane. Difficulty=Very Hard/Easy I hate hate hate fighting Chaac during the laning phase. His clear is fantastic once he hits level 2. He has fantastic sustain, and a pain-in-the-*** slow and oh yea... lets not forget his big AoE silence. Thunder Strike will get thrown into the middle of your minion wave then warped to with Torrent. Combine those with Bluestone Pendant and he clears so damn fast. Gonna get in a boxing match with him... forget about it. The sustain from Rain Dance is soo much early game and Ravana doesn't have anti-heal built into his kit and again, that slow is such a pain to get away from. You definitely need to play defensively, try not to over extend, and hopefully get some help from your jungler till you can clear waves decently yourself. Late game, Chaac is a non-threat. Sure the big silence from Storm Call is annoying, but his damage isn't great and his heal only effects himself, not the whole team, like Guan Yu's Conviction. If you or your support buy anti-heal ( Brawler's Beat Stick is a decent choice on Ravana), that will help tremendously. Difficulty=Easy The biggest annoyance about Erlang Shen early game is that his Howling Celestial Dog proc's Death's Toll, so his sustain is pretty decent. His 72 Transformations ignores the basic attack movement penatly if he transforms into the Mink. Thankfully you have a slow and root to deal with that. 9 Turns Blessing is his ultimate, and it has great healing and mitigation. It doesn't do any damage tho, so when used in the laning phase, it mostly forces a stalemate. It can be a pain during team fights tho. Play aggressive and you should be able to bully Erlang Shen. Difficulty=Unknown I haven't come across a Guan Yu yet in season 4 so I don't have much insight to give you guys. I've fought Loki, Izanami, Nu Wa and even a damn Anubis in the solo lane, but not Guan Yu. I will update this when I can. Difficulty=Hard Hercules is definitely a pain to deal with. He has 2 good forms of CC with Driving Strike and Earthbreaker. Don't get too close to the tower on him, or you risk being pulled in with those same two moves. His passive, Strength from Pain, increases his power every time you damage him, making him more dangerous. And let's not forget Mitigate Wounds. It heals him for a decent amount, gives bonus protections, and heals him for up to 70% of the damage he takes for 4s after using the ability. Definitely makes him a ***** to deal with. If your opponent build a good amount of power or pen, then Excavate hits like a truck... and it can hit multiple times. Pay attention to when it's coming and Overhead Kick can save your life. Difficulty=Easy/Medium Nike I fell, is another stalemate Goddess you'll fight. Her biggest strength is her passive, To Victory!, as it give global buffs to her teammates during the match. Rend does decent damage and can disarm is it hits you 3 times (which isn't a huge problem to disarm Ravana for a second or so). Valiant Leap is a standard leap. Nothing special. Sentinel of Zeus gives Nike a shield, and slows all enemies by 20%. This is an excellent ability for tower diving, so always be aware of that. Plan of Action gives her other 3 abilities a bonus effect. Rend gains a 3rd hit which can disarm, Valiant Leap travels much faster, and Sentinel of Zeus gains a bigger shield and stronger slow. If you can catch her with her leap or ult down, it will help greatly to root/slow and bully her around a bit. Just be careful for tower dives/ganks with [[Sentinel of Zeus up. Difficulty=Hard/Medium Odin falls into the same category as Chaac. An early game bully that falls off a bit late game. He's gonna out clear you with the classic Lunge and Raven Shout combo. He's gonna slow you, just like Chaac, with Gungnir's Might. Watch out for Ring of Spears, your healing is reduced to ZERO while in the ring. Don't expect 10-Hand Shadow Fist, Meditation Cloak, or any other ability to help you. If you can survive in the ring, just box it out, but if you're getting ganked, use Mystic Rush and get outta dodge. Once late game comes around, you're just as annoying to the enemy team to deal with. Difficulty=Medium/Hard Osiris is an annoyance both early and late. He has a slow and stun, with Sickle Strike and Spirit Flail respectively, plus his passive Fragmented and Judgement Tether and ult Lord of the Afterlife give damage reduction/mitigation. You may need to play defensively to avoid constantly being CC'd. Once you get a Gladiator's Shield or Breastplate of Valor online, you can deal with him much easier. Difficulty=Easy I've been able to bully Sun Wukong for the most part this season. The Magic Cudgel and Master's Will are decent wave clear. His 72 Transformations has a stun and a knockup. Can be a little disruptive during a teamfight, but nothing to worry much about in the laning phase. His only sustain is his ult, Somersault Cloud. The biggest problem I've seen is a Wukong using it neear full health and sending the clone to tank the tower and diving you. Be careful for that, but otherwise, I haven't seen a Wukong to be much trouble. Difficulty=Unknown See Guan Yu, above. Difficulty=Medium I feel like he's a better Sun Wukong. The wave clear is good once he hits level 3-4 (I haven't come across a variant with anything but Bluestone Pendant too). Clear The Path does ok damage, is his dash and can knock you up, making you easy prey for Awilix. Armored Umbrella does good damage and scales really well. Umbrellarang does meh damage, but it can hit you twice, plus is slows you AND slows your attack speed. He'll be able to at least match your clear, if not be a bit quicker, especially if you bought Death's Toll. Everytime he buys a physical protection item, his physical power also increases, thanks to his passive Sleeping Giant. His ult, Colossal Fury has fantastic sustain, makes his basic attacks become AoE, increases his phsyical protection (and power thanks to Sleeping Giant, AND the more you attack him, the longer he stays in the Big Baby form. All-in-all, you will probably stalemate with Vamana early game. You both have solid wave clear, sustain and a form of escape. Hopefully you can gank him once or twice. April 12, 2017 - Version 1.01 - Updated Items section, Added Patchnotes section, changed "Typical Final Build" in Purchase Order section. Generally speaking ravana has an easy time sticking to enemies, so I dont see the need for frostbound on him. Instead, build jotunns allows you to root, slow, immune, and ult more often. Because all of ravanas abilties do damage, the extra pen comes in handy too. Also because ravana has slow base attack speed, hes not making much use out of qins. A better dps item instead would Stone Cutting Sword. Its cheaper, gives you more movement speed, physical prot, and pen that not only contributes towards basic attacks, but also to all 4 of his damaging abilities I mentioned earlier. Combine this with exe for % pen and you have yourself a good dps build with solid prot. and late game you can sell breastplate for mantle. He doesnt need the cooldown as much as he needs the prot. 118249 masterricu Generally speaking ravana has an easy time sticking to enemies, so I dont see the need for frostbound on him. Instead, build jotunns allows you to root, slow, immune, and ult more often. Because all of ravanas abilties do damage, the extra pen comes in handy too. Also because ravana has slow base attack speed, hes not making much use out of qins. A better dps item instead would [[stone cutting sword]]. Its cheaper, gives you more movement speed, physical prot, and pen that not only contributes towards basic attacks, but also to all 4 of his damaging abilities I mentioned earlier. Combine this with exe for % pen and you have yourself a good dps build with solid prot. Here's a final build again to give you an idea of what it looks like: [[warrior tabi]][[breastplate of valor]][[jotunn's wrath]][[hide of the urchin]]/[[spirit robe]][[stone cutting sword]][[the executioner]] and late game you can sell breastplate for mantle. He doesnt need the cooldown as much as he needs the prot.